London, England. Publisher: Quest Society, John M. Watkins. Editor: G.R.S. Mead. The Quest was unique: massive (almost 200 pp. an issue), thoughtful, scholarly, diverse, and restrained. 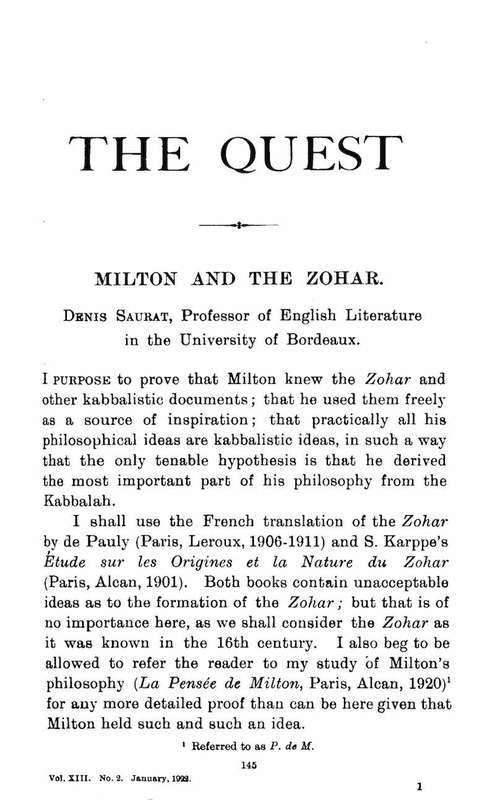 The Quest Society was "designed to help those who [were] seeking for a understanding of the purpose of life and the means of self-realization," and its editor, G.R.S. Mead (1866-1933), gave an impression of sincerity and seriousness in a world of endeavors more known for their opposites. He was a scholar, though not an academic, and his works of translation and synthesis of late classical thought never received the recognition they might otherwise have but were sufficiently broadly recognized to attract the cream of British intellectual thought in the first quarter of the twentieth century. He had helped H.P. Blavatsky in writing and editing The Secret Doctrine> (1888) and in publishing her journal Lucifer, which he later edited, and started the Quest Society in 1909 along with other disillusioned Theosophists. The contributors to Mead's Quest read like a who's who of occultists and and scholars and of those who inhabit that borderland between scholarship and enthusiasm: Robert Eisler, Gershom Scholem, Evelyn Underhill, Ananda Kentish Coomaraswamy, A.E. Waite, Ezra Pound, Rudolf Bultmann, Rabindranath Tagore, Gustav Meyrink, A.E. Waite, Kenneth S.L. Guthrie, Arthur Machen, Fiona Macleod, W.B. Yeats, Algernon Blackwood, et al. The journal also published a Quest Reprint Series with selected articles on various topics ("The Sacred Dance in Christendom," for example). BL; Boston College; Universities of Rochester, North Carolina, Wisconsin, California (Los Angeles); McMaster University.